The kids and I headed to Heathrow last night with Harriss, and we've seen her safely on board her flight home to the US. Bon voyage, sweet niece of mine! I hope you had as much fun with us as we had having you here. Now, it's back to reality, and house-shovelling, and de-cluttering, and all of that jazz. I'm whipped, but did start an interesting new knit on the train to London yesterday. It's the Revontuli shawl. [Go look; I'll wait. It's a worthy pattern!] Revontuli means rainbow in Finnish, and it looks like the perfect pattern to show off a strongly striping yarn. 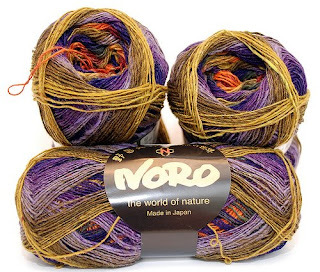 And strongly striping yarn is something I have, since I purchased a single skein of Noro Sock at the IKnit festivities. I believe the colorway is this one (picture nicked from Flickr), with earthtones and a vivid purple. I have enough to make a shoulder scarf-sized shawlette, methinks. I've seen at least one other on Ravelry that used a single skein. I'm almost done with the Soctor Who socks (at the toe of sock 2) so I hope to get a decent picture in daylight for posting. Hope all is well with all of you Gentle Readers. IKnit, Harlot, and Yarn, Oh My! Yesterday was IKnit Day in London, and as my husband amusedly pointed out last night when I was giving him blow-by-blow recaps, it was, for knitters, something like a sci-fi convention for Star Trek fans. I got up at oh-dark-thirty, with backpack and knitted alien in tow, and made an early train from King's Lynn. Once in London, I tubed it over to Oxford Street area and checked out the big Waterstones briefly, and then Hatchard's, which I liked much better than Waterstone's, to be honest. Hatchard's is in a lovely older building. Several floors of interesting books, many I hadn't even seen at the big chain stores. I wandered over, via breakfast and the Times, to the Horticultural Halls for IKnit. When I got there just before opening time at 11, the queue was literally around the block. It was rainy, but I had an umbrella, and the fellow waiters were both friendly and decked in interesting handknits. What's not to love? Inside the hall, there were workshops (great, I heard, although I didn't attend), fashion shows (good), stalls for charity knitting projects, and vendors galore. Oh, wow. The vendors. So nice to pat some of these yarns in person. I picked up some Addi Turbo Lace needles in a size I needed, dropped off my alien to play with the others on the competition display table, browsed all the stalls once, knit on the World's Biggest Knitting, chatted with other attendees, and commenced to spend my limited-to-cash disposable income. After lunch (a sandwich, a soda, and some quality time spent queueing and talking knitting and comparing knits with another solo knitter) and the vintage knitting fashion show, I headed over to the hall across the street to hear the Yarn Harlot's talk and Q&A. Man, she's funny. Man, that hall was full. Man, it was great to be there, and be alive, and be among so many other knitting folk. Afterward, she came to the main hall for the booksigning. That was another fun queuing time, sighting gorgeous shawls and wraps and bags and jumpers. After seeing so many shawls, I want to knit one in jeweltoned silks. They absolutely shimmered. The Harlot (aka Stephanie Pearl-McPhee) was so lovely and friendly to each person she met, including meeeee. She complimented my jacket (which is an awesome chartreuse wool number, even if it does make me look as big as a house), noted my unusual accent ("You're not FROM around here, are ya?" sort of thing), and commiserated with my gauge difficulties when I showed her the lovely Snowdrop shawl (her design, my first lace, and waaaay oversized). All that in less than a minute. She rocked. Intermixed with talking to knitters, sitting and knitting and watching fashion shoes, and all this loveliness, I did do some stash enhancing. I came home with some awesome stuff, mostly lace weights, that I hope to photograph later. The interim camera I was using was pretty rotten when it comes to focus. I did get the following blurry pics, but I must refer you to Liz at Knitting on the Green, who has posted some great, and CLEAR, pictures of the day! Check out the end of her post, when she mentions my buddy Susie kinnearing her when we first met! Who's that chartreuse person? Got home at 11 PM, after a fun "incident on the line"-related re-route from King's Cross over to Liverpool Street Station and the Oh-so-local to Cambridge, followed by an hour's wait on the platform there. Here we have a picture of the wonderful Yarn Harlot signing my book. See the chartreuse? Oh, look! More chartreuse. It's me handling the World's Biggest Knitting. A view of the Alien competition entries, early in the day. My batteries died before the winners arrived, but every. single. thing. was fantastic. My alien, behind the stripey green tentacled one, was definitely the poor little matchgirl, but it was fun to bring one along. Here's Acrilla the Pun, from Planet Orlon in the star system PolyAstra, with a magenta friend. 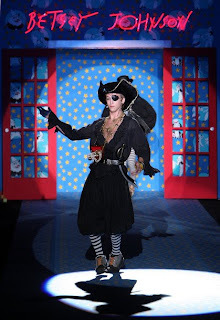 And a completely random shot, for the kids, of this knitted pirate and treasure. Aaarrrrr! Better First Day Pic; Mystery Stole 4? To all the friends and family who read my e-mail earlier, this is what First Day Girl looked like without half of her cut off. Promise to get a picture of First Day(ish) Boy soon, too. As for knitting, I'm halfway done with sock 2 of my Soctor Whos, and preparing for Mystery Stole 4 to open for business. Anyone out there signed up for that? I just returned from the first day drop-off, and here's to a great new year at school for the kiddoes. Sorry for my absence last week (really, most of the summer), but David was off and we were touristing our little toes off: Salisbury, Stonehenge, Windsor Castle, Legoland, and another trip to the Doctor Who exhibition. I'm a wee bit tired. This week we have fewer plans: Harriss will catch up on some school work, she and I are going to see the Prickwillow Drainage Museum (finally!! Whoo hooo), and Saturday I have a knitter's thing that includes a talk by the great Yarn Harlot. I'm excited. We finish our week with a birthday - Harriss' 17th! I do have pics from the trip, although not from our camera. That has gone missing since the History Fair at West Acre and either it's in a bag I haven't found, or I really lost it. Sigh. I made Harriss take lots of pictures with Precious Junior, however. That's her camera, obviously. I also used it for first day of school pics, but will have to wait to download them until later today.